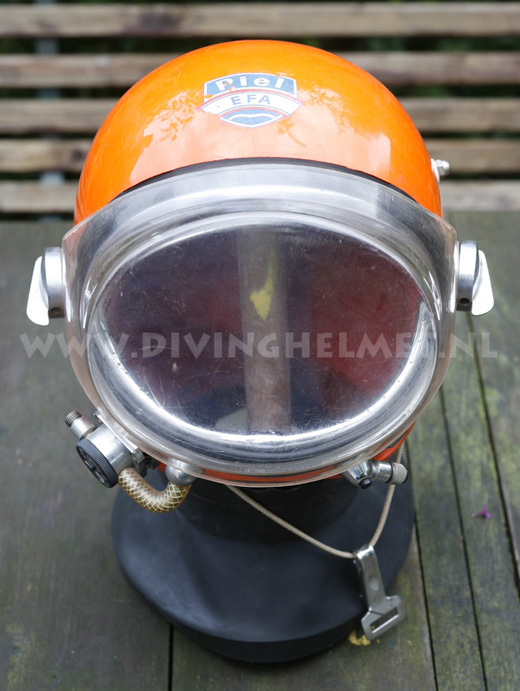 Whoever handles one of these helmets in their hands can hardly believe that it was meant to be used for underwater exploration because a motorcycle helmet is heavier built than the ‘Piel EP’... But a second look reveals that Piel, originally Denayrouze, turned back to its roots with this helmet. 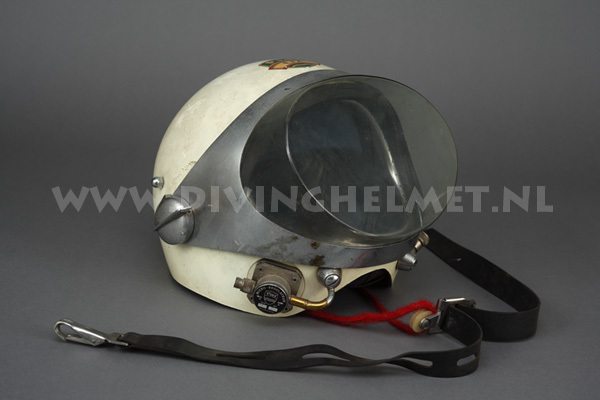 Their very first helmet diving apparatus also was a helmet with a demand valve: the pig snout mask or 3 bolt diving helmet with the regulator back pack. 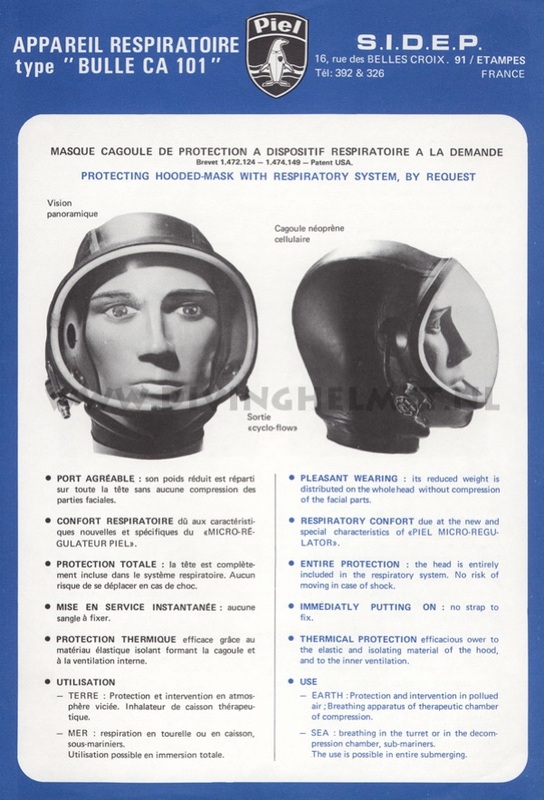 This little plastic helmet was designed by Yves Le Masson according to exactly the same idea, only has the size of the heavy brass and copper helmet been reduced to a light plastic shell with a rubber hood and neck seal inside of it. The heavy iron regulator backpack has been reduced to the size of a wrist watch. The original name of the Denayrouze back pack was ‘REGULATEUR’, the wrist watch size demand valve on this new helmet is signed with ‘MICRO REGULATEUR’. The SIDEP Piel EP100 EP200 and EP300 helmet. In the book the navy comes up with some impressions about the EP100 apparatus. -the nice futuristic look of the helmet which looks like the helmet of a cosmonaut, which has an attraction which should not be under estimated. -the helmet has an important buoyancy. This makes a complicated system of ropes and straps needed, and extra weights. -the helmet has a large ‘dead space’. It is never good to respire in a closed space. 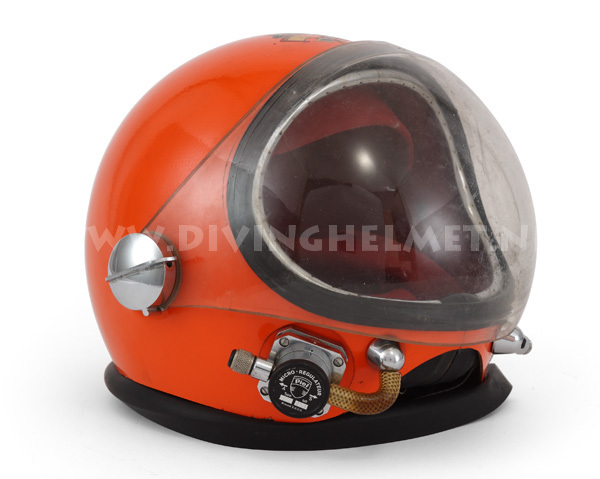 But according to the constructor of the helmet there is no dead space in this helmet because the regulator provides a stream of fresh air straight towards the divers nose and mouth. So when he breathes he inhales only very little air from inside the helmet. - the round faceplate which caused distortion has been replaced by a flat one . -the connector where the breathing gas arrives is better designed. 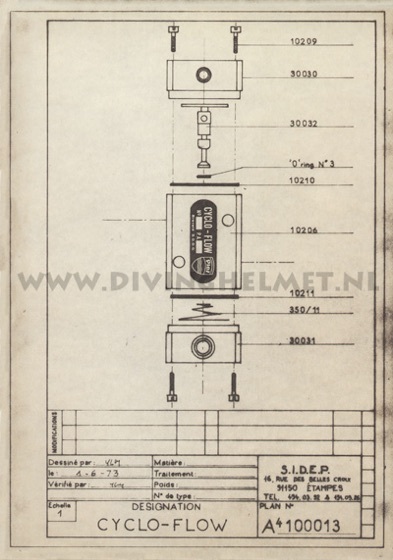 -the functioning of the regulator which can now be adjusted by the diver himself. -the neck seal has been made longer. The SIDEP Piel EP300 helmet. When we may believe this document then this is the EP300 helmet. The color is no longer white but ( probably ) orange / red. The faceplate has no chromed frame around it any longer. 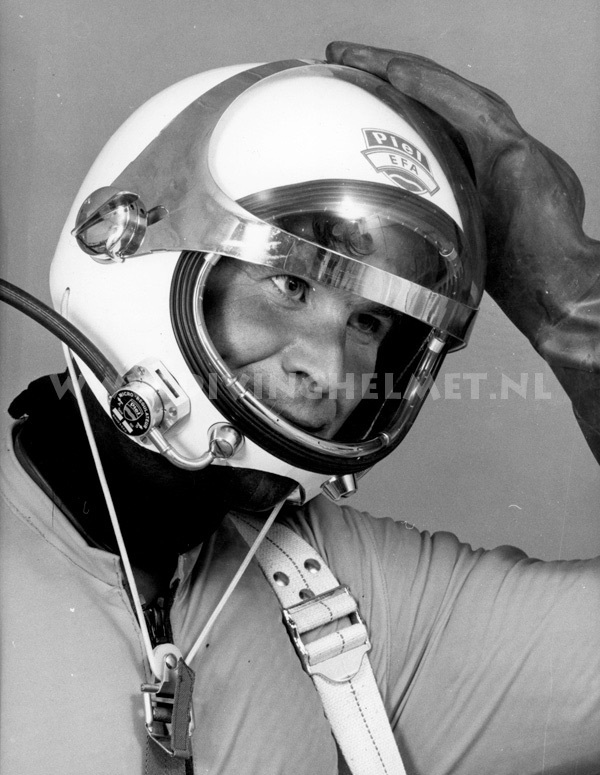 The rope of the ‘pull down’ system passes under the helmet shell. But now the hose between the first stage and the second stage of the regulator or Cyclo Flow passes through the right side of the helmet. Document David L.Dekker Collection. The SIDEP Piel EP100 vs. the EP200 helmet. 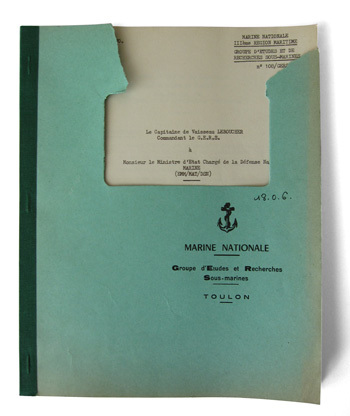 In my library I have a book which was published by the Marine Nationale ( French Navy ) in march 1970. The entire edition of this book was 5(!) copies. 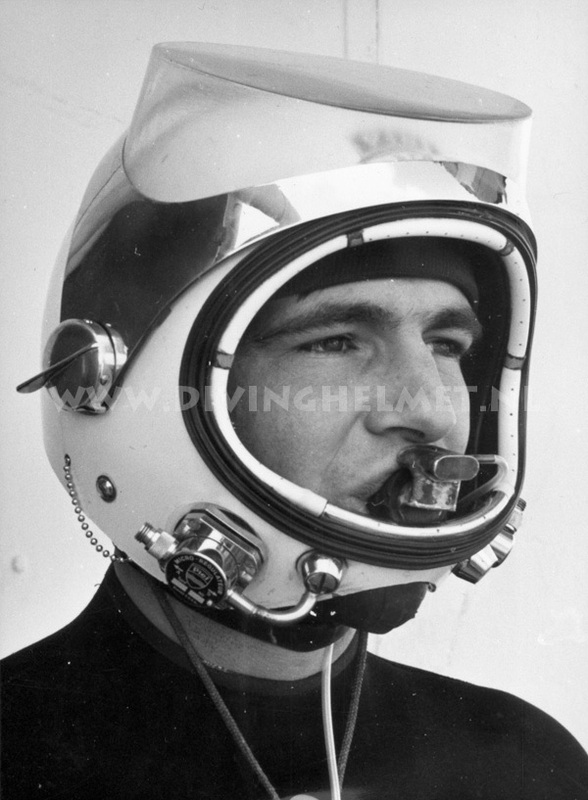 The books is in fact a test report of the Piel EP100 helmet equipped with the ‘Cyclo-Flow’ device. 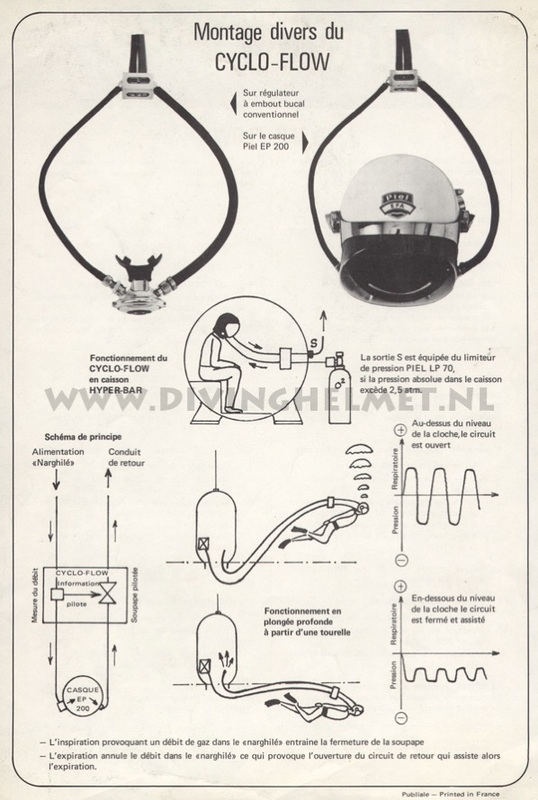 The Cyclo-Flow is an apparatus used to create a return line when performing deep diving on helium oxygen mix ( pls read the ‘La Spirotechnique Diving Helmet’ chapter to learn more about deep diving and the use of the ‘return line’ ) This book reveals some interesting observations. With the book I have a letter written by monsieur Piel himself to the French Navy ( G.E.R.S. 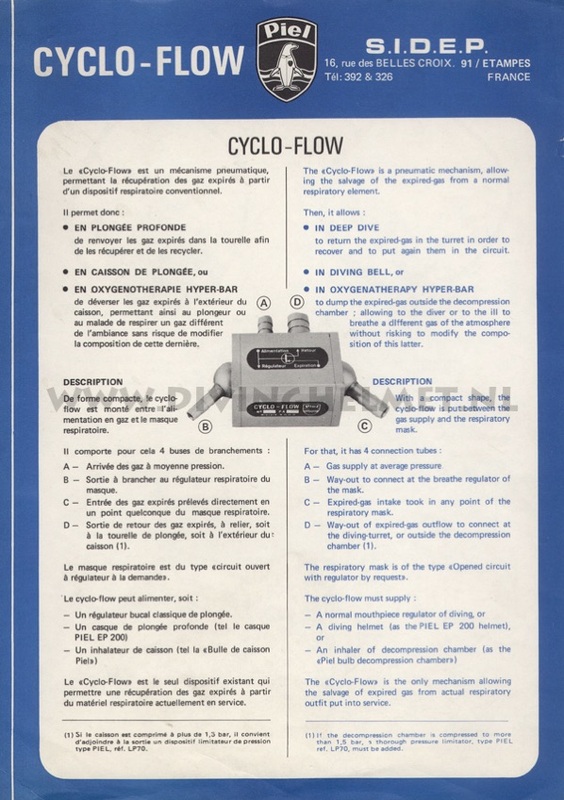 83-Toulon ) which is in fact the receipt for a supplied EP100 diving equipment and a ‘Cyclo-Flow’ apparatus. The letter was sent on the 9th of June 1969 from Etampes where Piel was based at that time. Monsieur Piel asks the navy to return the equipment before the 1st of July, it seems to be supplied only to do some tests with it. The first thing we learn from this letter is that in June 1969 Piel still built the EP100 helmet. The Cyclo-Flow receives breathing gas at 7 to 8 bar over ambient pressure which it supplies to the micro regulator on the helmet. 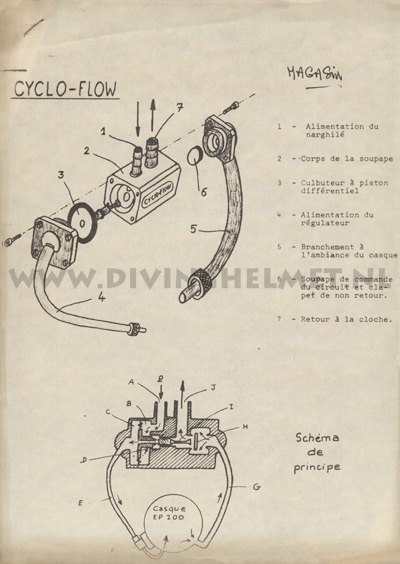 The return line is connected to the exhaust valve of the helmet, passes through the Cyclo-Flow and goes to the bell where it is filtered and enriched with fresh oxygen. The return line is operated by the difference in depth between the diver and the bell which should be between 5 and 15 meters ( 0,5 to 1,5 bar ) Would the diver swim above the level of the bell then it becomes difficult / impossible for the diver to ‘blow’ the exhausted gas back to the bell, but then the exhaust valve lets escape the exhaled air out of the system into the water. See illustrations here above. Document David L.Dekker Collection. -when inhaling the exhaust valve is closed and only the micro regulator works. -during the short moment between inhaling and exhaling a small quantity of gas escapes through the exhaust valve. 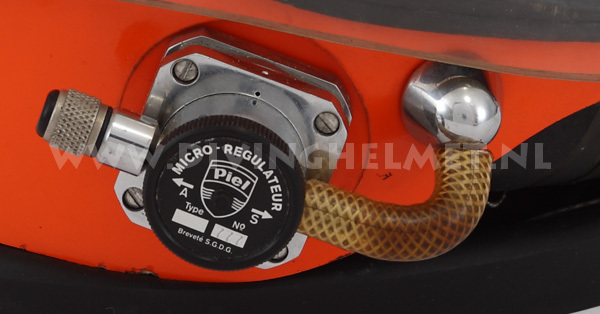 This creates a light under pressure inside the helmet which activates the micro regulator providing a ventilation of the helmets dead space and reduces the Co2 level. -When exhaling the micro regulator is closed. -the functioning of the system depends on the adjustment of the micro regulator. During the tests the sensitivity of the micro regulator was reduced which created a continuous flow from the regulator to the exhaust valve. 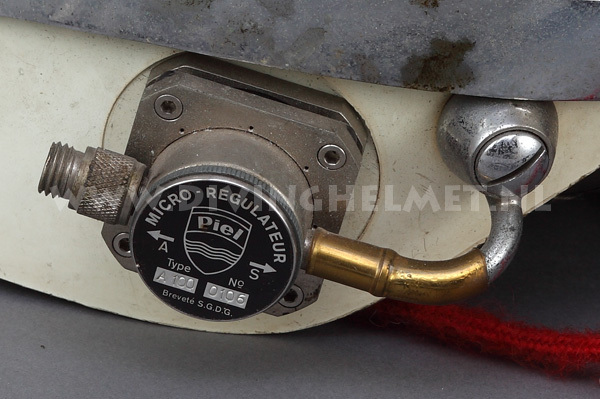 - the helmet PIEL-EFA EP 100 which has been tested by us has a large dead space and should, according to us only be used in combination with the Cyclo-Flow devise. The concentration of C02 in the dead space would get to high without this ventilation. -equipped with the Cyclo-Flow and breathing air the evacuation of Co2 is not 100% and could become dangerous. -equipped with the Cyclo-Flow and breathing helium-oxygen the evacuation Co2 is very good but still depends on the fine adjustment of the micro regulator. The breathing comfort is convenient. 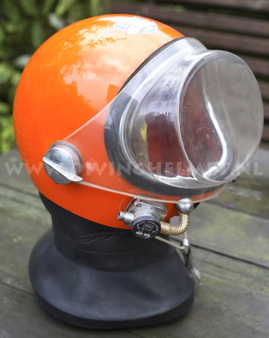 Last but not least: the Piel SIDEP ‘Bulle CA 101‘ helmet. 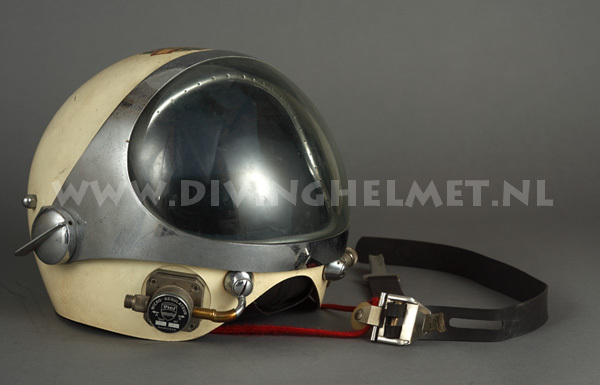 I never saw one for real, all I have on this helmet is this document which unfortunately is not dated. It comes close to the EP helmet. According to the document it can both be used on land and under water. Document David L.Dekker Collection. 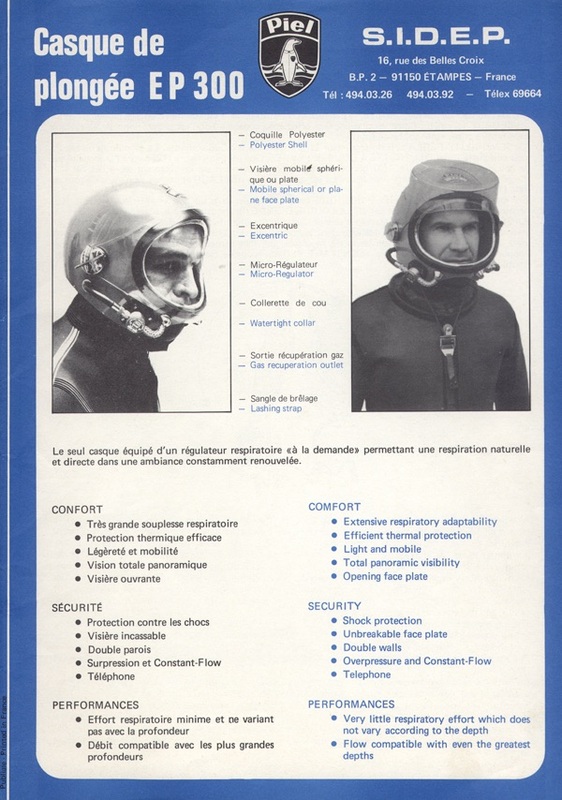 SIDEP manufactured diving suits, regulators and diving helmets for sports divers and professional divers. SIDEP still exists and is situated in Bretagne, France. 1966. 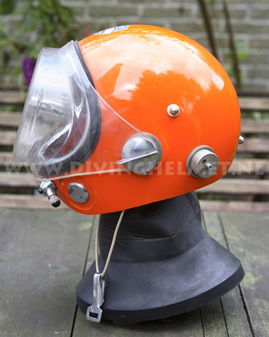 ‘SIDEP Piel EP100’ helmet. 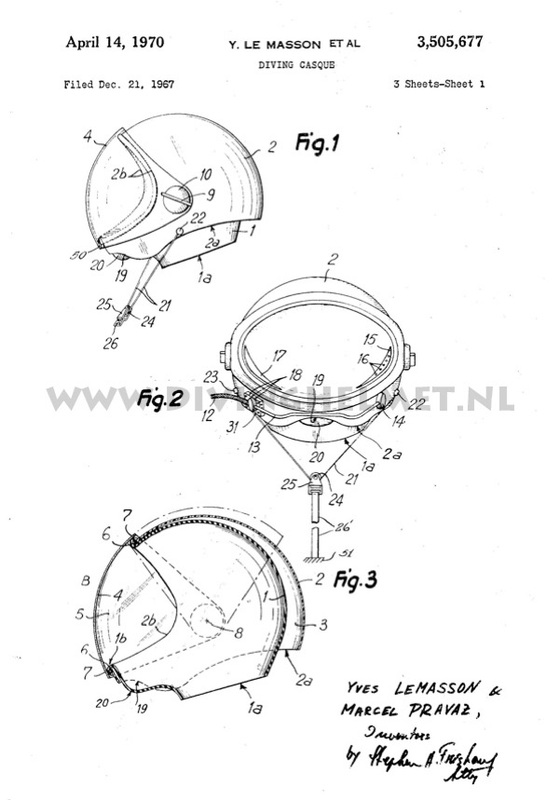 The USA patent of the Piel-EFA EP100 helmet is dated April 14, 1970 and ‘filed’ in December 21 1967. 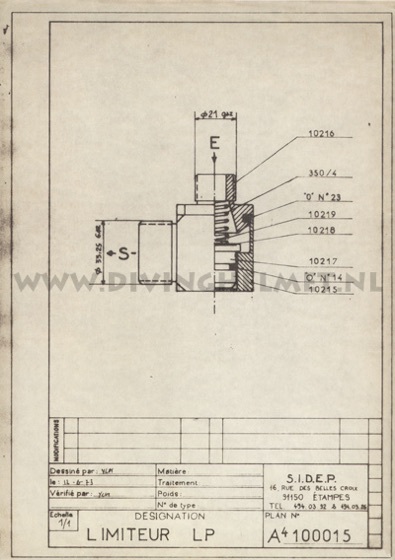 But in the text that comes with the patent drawings is indicated that the patent was claimed in France one year earlier on December 26 1966. 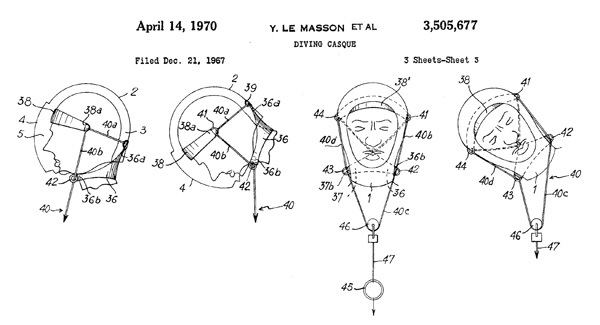 Yves Le Masson and Marcel Pravaz are mentioned as the inventors. 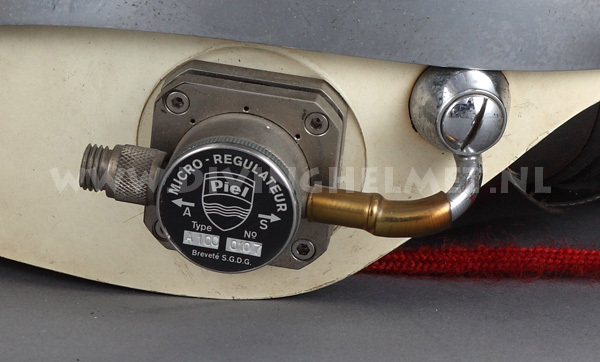 Yves Le Masson worked with Piel since the late nineteen fifties, one of his earlier inventions were the Rebreather Divers Apparatus CFM1 and CFM2 which were also designed by him and built by Piel.